The JHill Design studio is located in a large room in my house. A large, very cold room that is currently being heated with a space heater - that's what you get with old houses with lots of windows. But it is those windows that let me see color clearly when I'm pouring through my Pantone books looking for the perfect colors for my patterns. 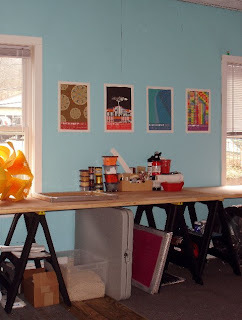 The "My hand hurts" poster near the window has special meaning for me, if I sit at the computer too long my carpal tunnel problems flare up so it is a great reminder to get up and move around. 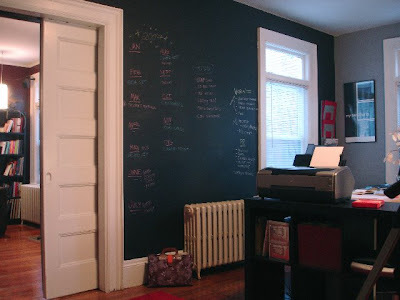 One wall of the room is painted with chalkboard paint which is so incredibly useful. That is where I make PR and product release schedules for the year, reminders of inventory that is running low and were guests leave me little drawings. 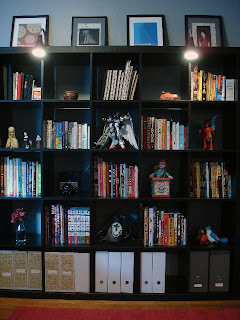 We have a large bookshelf that is full with our library of art/design/travel books as well as a nice little collection of tchotchkes. The big desks are hollow doors on top of file cabinets, one for me and one for my lovely intern. I love having so much space to lay out all my sketch books, to do lists and all my other little piles. The "My Hand Hurts" poster reminds me of something I've recently done. I'v got a few posters up (handmade of course) in my workspace reminding me nicely to balance my time, only spend money on stuff that feeds the business or my family, and the project focus of the current month. It actually helps to be able to manage my sometime overwhleming idea/wrok load. I love the idea of chalkboard paint on the wall. I'm constantly writting notes to myself and then losing them. Hard to do that on a wall! if you do the chalk board paint, go paint a layer of "magnet paint" underneath first. i wish i had done that, then you'd have magnetic AND writable walls! Love, Love, LOVE the chalkboard wall!